Chicken Florentine Recipe-Made in One Skillet, Easy and Impressive! 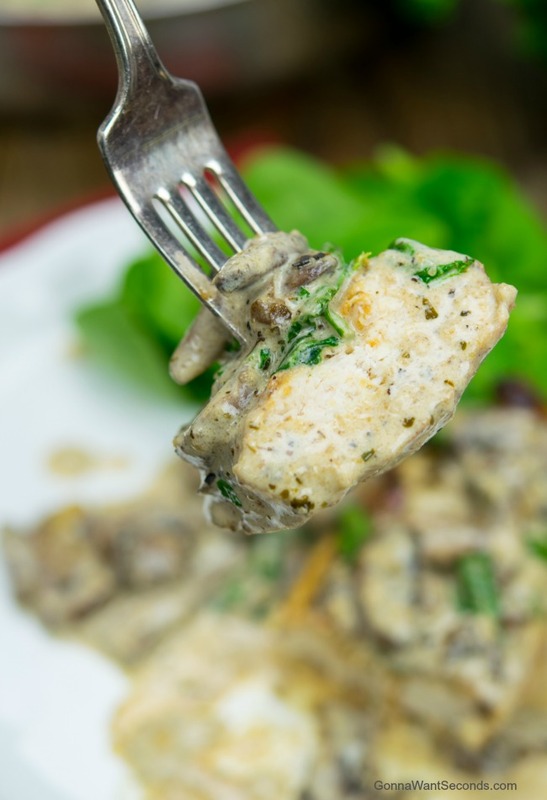 You’ll be floored by all the layers of flavor in this Chicken Florentine recipe! A rich, cheesy sauce, with leafy, green ribbons of spinach coat tender cheese-crusted chicken breasts in this simple but impressive dish. We’ve all experienced homesickness at one time or another, and I think food is one of the most reliable cures. Whether it’s digging through old recipe cards to make your grandmother’s Christmas cookies or stopping by the neighborhood restaurant that makes pot roast just like mom did, the right ingredient or dish can ease that separation anxiety. When Catherine de Medici left her birthplace of Florence, Italy, to (eventually) become Queen of France, she brought her own remedy, something that would always remind her of home. Spinach. Although I suspect many people actually left home (or at least the dinner table) over this infamous leafy green, my Chicken Florentine recipe transforms spinach into a coveted dish, guaranteed to leave family and guests with fond memories of this easy but elegant, home-cooked masterpiece. Thanks to Queen Catherine, many dishes that use spinach, especially those with a rich, cheesy (Mornay) sauce, are considered a la Florentine, which is French for “in the style of Florence.” Eggs and fish are pretty common protein additions, but chicken and spinach are a match made in heaven (or at least in Italy). 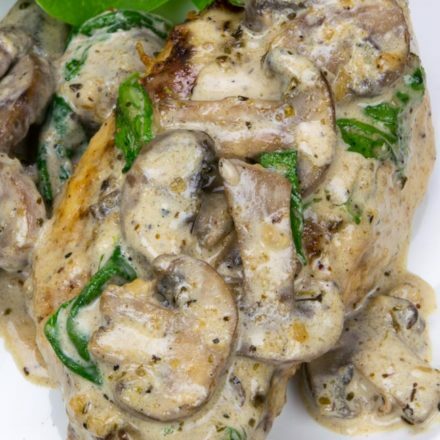 You may have ordered stuffed chicken Florentine at restaurants before, baked or pan-fried breasts stuffed with spinach, mushrooms, and cheese. This is my twist on that dish, an easy Chicken Florentine recipe that has all the same, wonderful flavors without all the fussy stuffing business. Oh, and copious amounts of a drool-worthy sauce. We’ll start with sautéing mushrooms and aromatics, in this case, a little garlic. Although some recipes pan-fry their chicken breasts first, then add the veggies to the pan as they’re building the sauce, I find my method of removing the cooked veggies and incorporating them at the end helps preserve the nice, firm texture of these perfectly cooked mushrooms. It also keeps the garlic from cooking too long and turning bitter, plus makes the sauce reduction process more efficient without all the mushrooms floating around. For the mushrooms, my absolute favorite is cremini since they seem to have a slightly stronger mushroom flavor and meatier texture than other varieties, but button mushrooms work just as well in this particular dish. The next step is, of course, pan frying the chicken breasts. A light dusting of flour, seasoned with Italian herbs and some grated Parmesan, is a flavorful and critical part of capitalizing on all the wonderful textures in this dish. The cheese in particular adds a lovely saltiness and browns up really nicely. In addition to adding a crispy, flavorful coating to the chicken, the crust also helps insulate the meat to prevent overcooking and creates a surface area designed to cling to the rich, velvety sauce. A little note about Parmesan. If you can buy a block and grate it yourself, you definitely won’t regret it. It has such a wonderful, unique nuttiness to it that often gets lost when you buy it in one of those green shakers. If that’s not feasible, though, you might try using the pre-shredded variety, at least in the sauce, since I find it melts a little better. And trust me, it’s the Chicken Florentine sauce that makes this dish! The caramelized pieces of vegetables and chicken are now ready to turn a simple sauce into something you’ll be wanting a loaf of dunkable bread for. This fond, which is the culinary term for the browned bits in the pan, is the main reason I think my version works better than a baked chicken Florentine or chicken Florentine casserole. Without the magic happening in the frying pan, you’re stuck with a second-rate sauce. I like to do the deglazing with a little chicken stock. It’s so much more flavorful than water, and you can even use chicken-flavored Better than Bouillon (1/2 teaspoon for a half cup of water) if you don’t have any canned or homemade stock handy. Take your time to loosen all the little flavor nuggets on the pan, letting them melt into the sauce and reduce until the flavors are concentrated. That traditional Mornay sauce I mentioned earlier is enriched with cream and cheese, and that’s what we’ll use to finish this one. Just be sure to keep the sauce at a low simmer once you’ve added these ingredients to avoid boiling and curdling the sauce. The last (and obligatory) ingredient is the spinach. You’ll stir some fresh chopped greens into the sauce just long enough for the leaves to wilt. If you want to avoid the chopping, you can also use baby spinach though the flavor’s a bit milder. Frozen spinach (thawed and drained REALLY well) will work in a pinch, but I really prefer the fresh in this recipe. The spinach adds beautiful color and a lovely texture to the dish, and we could talk about the health benefits of spinach (including reducing hunger cravings! 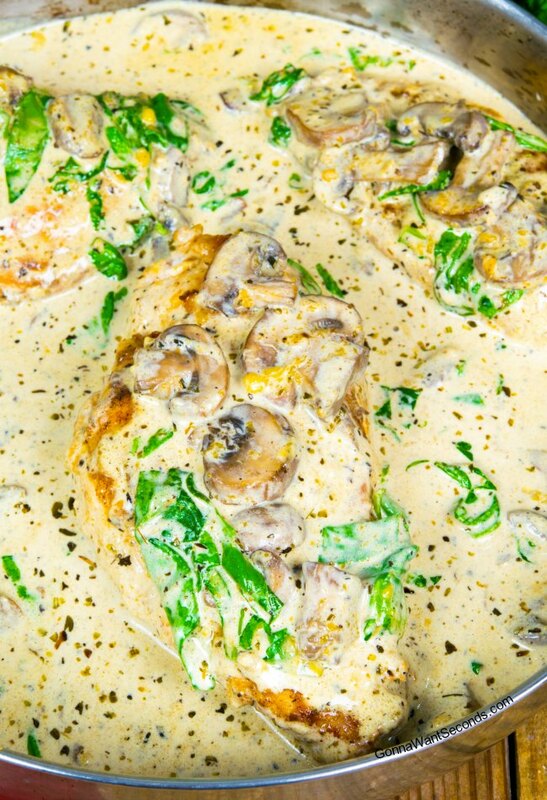 ), but it’s pretty obvious with all the cream and cheese this is not a healthy chicken Florentine dish. Let’s just focus on how luscious and to-die-for the sauce is! Although I don’t make this an official “chicken Florentine pasta,” with penne and chicken chunks that’s often (sadly) lacking in the sauce department, I definitely do recommend serving this with angel hair pasta and a nice baguette so you can sop up every last drop of the sauce. If you’re interested in making chicken Florentine, you could spend some time looking for a chicken Florentine Allrecipes version – there are only 6,000 or so recipes (including a chicken Florentine soup) for you to waste a few days pouring over. If you don’t have that kind of time, though, and I’m pretty sure none of us do, take my word for it. This is the best recipe – the only recipe – you need, and it just may make spinach a comfort food for you too! Fancy Flavorings – If you want to make this even more flavorful, you can use ¼ c. of dry white wine to replace half the chicken broth when you’re deglazing. You can also cook and crumble 4 or 5 pieces of bacon to sprinkle on top before serving. Mushrooms – I was always taught washing mushrooms was one of the seven deadly sins, but you can actually rinse them with water if you’ll be cooking them, as long as you minimize the amount of time they’re in it. If you choose this route instead of brushing them off with a damp paper towel or soft brush, just make sure you blot them with some towels and saute them long enough to remove any extra water. 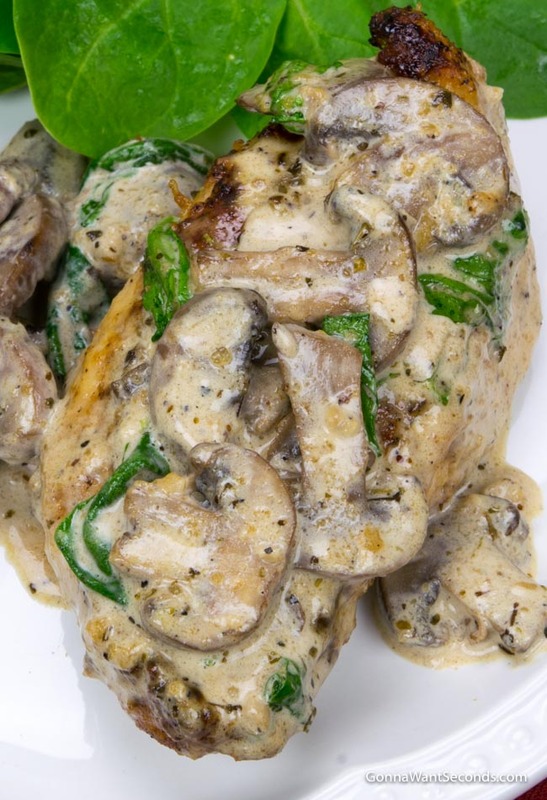 You’ll love all the flavors in our Chicken Florentine recipe! A velvety sauce, with ribbons of spinach, coat cheese-crusted chicken! Easy and impressive! Melt butter in a large skillet over medium heat. Add garlic and cook until fragrant, for about 1 minute. Stir in the mushrooms, 1/2 teaspoon salt, 1/2 teaspoon black pepper and Italian Seasoning continue to cook until tender, about 5 minutes. Remove to a plate and set aside. Pat chicken breast dry with paper towels to remove any moisture. Mix together flour, and 2 Tablespoons Parmesan cheese in a shallow bowl or plate. Dredge chicken breasts in flour mixture, shaking off excess. Add the remaining 4 tablespoon butter to the skillet. Cook the chicken over medium heat, until the chicken is cooked. Remove chicken to plate and loosely cover with aluminum foil to keep it warm. Add the chicken broth to the pan and bring to a boil over medium heat, stirring well to loosen all the brown bits on the bottom of the pan. Reduce the heat and simmer uncovered, until the broth is reduced to about 1/4 of a cup. Stir in heavy cream and 1/2 Cup Parmesan cheese and cook over medium heat until sauce begins to thicken. Stir in spinach. Add mushrooms and chicken back into sauce and flip it over once to coat. Serve. Chicken Bacon Ranch Pasta -This bubbling beauty is everything you want in a creamy, cheesy casserole and a dazzling dinner dish! French Onion Chicken – Our French Onion Chicken skillet is cheesy, packed with flavor and it’s a cinch to make. Leftovers (if any) have a very short lifespan. Chicken Riggies –This famous Italian-American pasta will rock your world! In Chicken Riggies, a thick tomato cream sauce smothers marinated chicken and veggie-rich rigatoni. My family of 8 is hard to please and this was a huge hit with everyone!! Thank you kindly for sharing this delightful dish! Bookmarked this recipe of yours, Kathleen!! It has three faves of mine in it: chicken, mushrooms, and the spinach!!! Barbara, I hope you enjoy this recipe as much as we do!